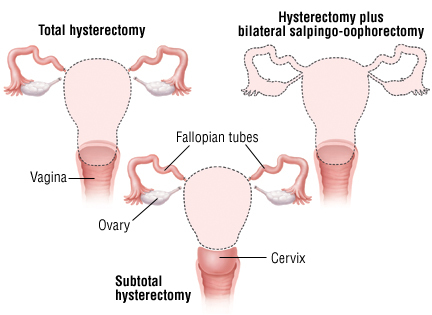 Subtotal, supracervical or partial hysterectomy. The uterus is removed, but not the cervix. Total or complete hysterectomy. Both the uterus and the cervix are removed. Total hysterectomy plus unilateral salpingo-oophorectomy. This procedure removes the uterus, cervix, one ovary and one fallopian tube, while one ovary and one fallopian tube are left in place. This procedure is usually done if a problem confined to one ovary is detected at the time of hysterectomy. After surgery, the remaining ovary should produce enough female hormones if the woman has not reached menopause. Total hysterectomy plus bilateral salpingo-oophorectomy. This is the removal of the uterus, cervix, and both fallopian tubes and ovaries. Removing both ovaries will cause surgical menopause in a woman who has not reached menopause because the production of female hormone stops when the ovaries are removed. Radical hysterectomy. This procedure removes the uterus, cervix, both ovaries, both fallopian tubes and nearby lymph nodes in the pelvis. This procedure is only done in some women who have gynecological cancer. Hysterectomies can be done with different types of surgical incisions (surgical cuts). Until recently most hysterectomies were abdominal hysterectomies, in which the uterus is removed through a horizontal or vertical incision in the lower abdomen.